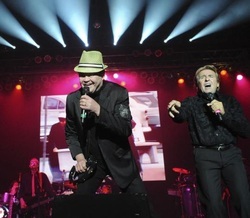 Forty-five years after first creating a frenzy by bringing teen-approved pop to the small screen, the Monkees still resonate, as seen Wednesday at the Lowell Memorial Auditorium where the band performed a two-hour show that went beyond surface nostalgia. Michael Nesmith bowed out of the current anniversary tour, leaving Davy Jones, Peter Tork, and Micky Dolenz to make the case that the Monkees were more than a prefab four cooked up in the 1960s by American entertainment executives to capitalize on Beatlemania. Tackling more than 30 songs may have been excessive, but the Monkees were persuasive in selling a catalog of indelible pop from the AM radio era. The band is still not to be mistaken for a Beatles doppelganger, but did prove itself an uncanny cipher of song styles influencing rock ’n’ roll through the music’s adolescence. The Monkees’ catalog, largely written by outside aces such as Tommy Boyce and Bobby Hart, Neil Diamond, and Carole King, reflects the period’s merger of folk and rock, its rise of garage and psychedelic styles, and the ironic appropriation of Tin Pan Alley innocence. Musical purists may have once bristled at the overt cashing in on flower power, but time has been kind to the Monkees, and the band members themselves seem to understand that what they wield is entertainment gold; no more, no less. Scott McLennan can be reached at smclennan1010@gmail.com.